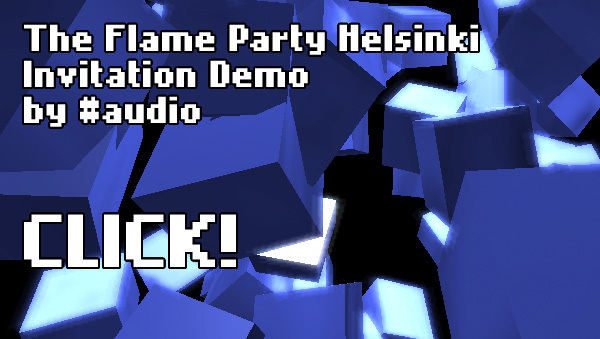 Over the last couple of nights members of the Mozilla Audio API crew (@secretrobotron and @ccliffe ) have enthusiastically put together our official Flame Party Helsinki invitation Demo. ENJOY, get yourself a ticket and scroll down to read our making-of interview!! tbx: The work of the #audio crew was one of the inspirations for us to start the DemoParty project, an initiative to foster artful exploration of the open web platform, which also dives into the Demoscene culture. Have you guys been previously involved in this art scene, before you started creating browser based demos? secretrobotron: While the demo scene has always intrigued me, I’ve never been a part of it until now, mostly because I haven’t had the same kind of access, experience, and coincidence as I’ve had recently in my time with #audio. However, like any worthy scener, I spent more time watching cracker demos on my C64 than really playing the games. So, I have a natural respect for the kind of talent it takes to pull off almost any effect. tbx: What makes the web platform so interesting for demo artists? What are the advantages compared to let’s say creating an animation on the Adobe Flash or Microsoft Windows platforms? secretrobotron: Quite honestly, the best part about this whole environment is how open it is. By its very nature, it’s meant to be open-source and hacker-friendly. If I see some effect that Mr. Doob has pulled off, the only thing stopping me from opening up his code and seeing what he did is my own terrible lack of free time. You don’t have that kind of experience with Flash. I’d say, the only things I miss are those little “compiling” coffee breaks, but, really, I’m okay without them. 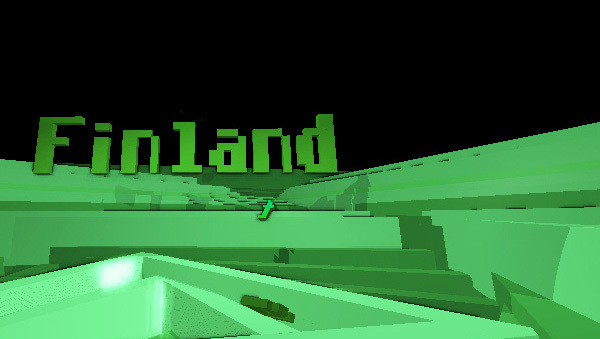 tbx:Looking at the aesthetics of your demos, some might say that this 3D stuff looks “totally 90s”. Why is that? secretrobotron: I don’t know that I’d classify our aesthetic as “90’s”, but that’s my bias talking. Instead, I’d probably say “immature”, and not at all from a negative perspective. We’re still at the beginning of the WebGL movement, and our tools see new improvements almost weekly. tbx: What are the technologies/frameworks you’ve used, and what is it that makes the Firefox audio API so interesting? I was introduced to the Firefox Audio API by the folks that put together the W3C Audio Incubator Group. #audio had already gone through a lot of the work to push the standard and implementation forward by the time I joined. It was easy to get involved since these guys were so passionate about it already. From an external perspective though, the Firefox Audio API is interesting because it’s simple, yet powerful. tbx: So are we going to see a second second life now or what do you think is going to happen in the next couple of years? What is fundamentally changing? Is the browser finally becoming a full operating system? secretrobotron: I really do hope to see more action in making browsers the focus for ingenuity and innovation. WebGL is already expanding with Nokia’s contributions to WebCL, and I’m very excited to get our hands dirty with that. I would imagine that WebGL is only one of the first steps in the realization that browsers enable not only connectivity, but a supplementarily media-rich experience, using serious technology. It’s our job to continue to push the envelope and give browser engineers stuff to do. tbx: Thank you so much guys for putting this demo together, we’re super excited about your involvement in the DemoParty project. Let’s definitely put together a web DemoParty in Toronto [ where severall members of the #audio crew are based ] !! secretrobotron: Can’t wait to see what the rest of the world has to offer to this community. See you all soon.